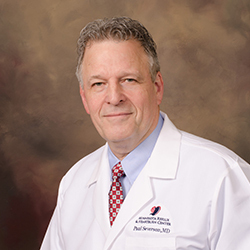 Paul A. Severson, M.D., F.A.C.S. Dr. Paul Severson earned his Bachelor of Arts and Doctor of Medicine degrees from the University of Minnesota. He completed his General Surgery Residency at Hennepin County Medical Center in 1984. He is a Diplomate of the American Board of Surgery and became a Fellow of the American College of Surgeons in 1988. He serves the University of Minnesota Medical School in Minneapolis as a Rural Physician Associate Program professor and has hosted surgery rotations for the Duluth Family Practice program as well as the University of North Dakota. He is Chief of Surgery at Riverwood Health Care Center and past Chief at Cuyuna Regional Medical Center. He is the Director of the Minnesota Reflux and Heartburn Center. Dr. Severson serves on a number of committees and is a member of numerous professional organizations. He is Past President of the Minnesota Surgical Society as well as the Hitchcock Surgical Society. He was instrumental in the formation of the Upper Midwest Bariatric Forum (now the Minnesota Chapter of the American Society of Metabolic and Bariatric Surgeons. Together with Dr. McCollister, he serves as co-director of the Minnesota Institute for Minimally Invasive Surgery (MIMIS) on the campus of Cuyuna Regional Medical Center. Dr. Severson is Founder and President of Project Haiti, Inc., a charitable non-profit organization that has provided humanitarian relief to the impoverished people of rural Haiti. Since 1989, Dr. Severson has been instrumental in sending hundreds of volunteers from all walks of life, including medicine, dentistry, economic development, and construction. He has spearheaded a national initiative to propagate minimally invasive surgery skills and techniques in Haiti, built a state-of-the-art surgery facility at Hospital de Bienfaisance (Charity Hospital), and established tele-surgery links to the outside world for the ongoing education of Haitian surgeons. The Minnesota Medical Association has honored him with their Community Service Award for his contributions. The University of Minnesota selected him as the 2011 winner of the “Distinguished Alumni Award”, the first graduate from the University of Minnesota Medial School Duluth to win the award since the medical school opened in 1972. Dr. Severson has trained over 70 regional surgeons in advanced laparo-endoscopic procedures and has repeatedly been selected “Clinical Teacher of the Year” by the medical students at the University of Minnesota Duluth. He is the Program Director of the MIMIS Fellowship in Advanced Minimally Invasive Surgery, Bariatric Surgery and Flexible Endoscopy. This highly sought-after post-graduate surgical fellowship has welcomed America’s finest young surgeons to MIMIS and the local community since 2006. As a result of the success of the fellowship, Dr. Severson has been appointed to the Fellowship Council Board of Directors as well as numerous leadership roles in the Society for Gastro-intestinal Endoscopic Surgeons. SAGES Global Affairs has appointed him to lead the development of the Global Surgical Curriculum, which is a systematic approach to sharing the most up-to-date medical knowledge with the rest of the world’s surgical residents, starting with the country of Haiti. Dr. Severson has special interests in bariatric (weight loss) surgery, gastro-esophageal reflux disease, revisional laparoscopic surgery, laparoscopic colectomy, minimally invasive varicose vein surgery (Trivex), minimally invasive hemorrhoid surgery (stapled hemorrhoidopexy), endoscopic carpal tunnel release, therapeutic endoscopy and missionary medicine.